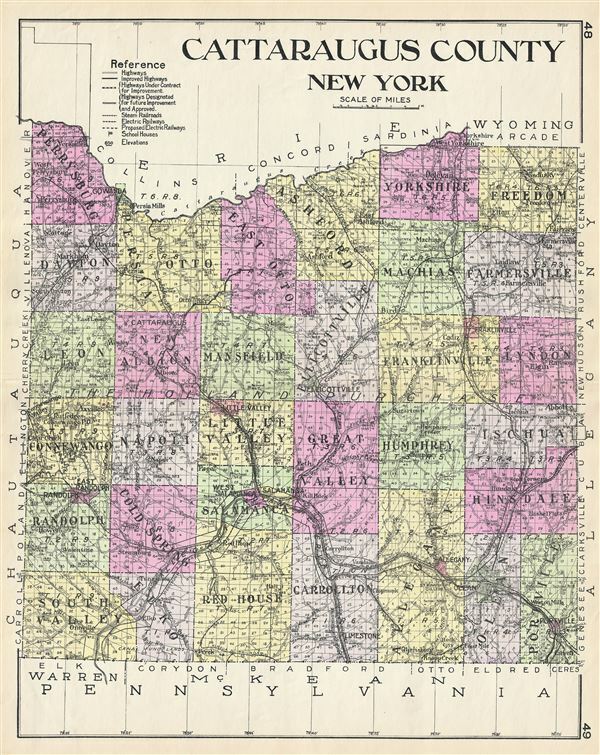 A highly appealing 1912 large format folio map of Cattaraugus County, New York, issued for the New Century Atlas of Counties of the State of New York. The map covers from Perrysburg to Portville, including Dayton, Leon, Connewango, Randolph, South Valley, Elko, Cold Springs, Napoli, Albion, Persia, Otto, East Otto, Ashford, Mansfield, Little Valley, Salamanca, Red House, Carrollton, Great Valley, Ellicottville, Ashford, Yorkshire, Machias, Franklinville, Humphrey, Allegany, Olean, Portville, Hinsdale, Ischua, Lyndon, Farmersville and Freedom. There is appealing detail throughout with the roads, towns, and railroad lines clearly represented. Various communities are identified with larger districts highlighted in vivid pastels. This map was issued as plate nos. 48 and 49 in Everts' New Century Atlas of Counties of the State of New York.